I can’t believe it has been a year since our last camping trip. So much has changed in that time, and looking back seems like watching an old movie. But, nostalgia is a funny thing and sometimes scent, feeling, taste or all three can take you back to a singular moment in time. For me, this campfire monkey bread always puts me near a camp fire, chatting with my family and enjoying time with my husband. We are going on the annual trip again this week, but this time with our beautiful baby James in tow. I can’t wait to create even more memories with him! As I’ve mentioned before, when we camp, we camp. That means fire cooking (Like cinnamon rolls), as little refrigeration as possible, and no electricity. While my grand parents are microwaving leftover spaghetti in their camper on the next lot, hubby and I are poking our dinner and dessert in the dying coals of our woodfire. (Not that there is anything wrong with microwaves etc while camping. We just enjoy the opportunity to get outside the box). 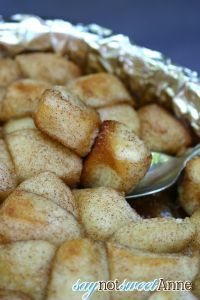 This campfire monkey bread recipe is one that we pulled out on a rainy and cold day last summer. Next thing we knew everyone was gathered at our picnic table stealing nibbles and enjoying the fresh baked taste of something straight from the fire. It is simple, it is easy to cook, and it only requires one ingredient to be stored in the cooler. Win win for me. Pack all of your ingredients pre-measured. It will make life easier. Line your dutch oven (or an old cake pan) with heavy duty alluminum foil. Use a little of the butter to grease the foil as well. 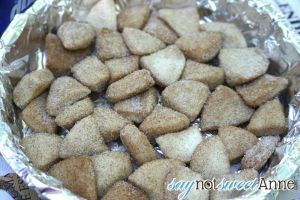 Open the biscuits and cut each one into quarters. They look irregular but don’t worry about that now. That is it! Remove from the heat and let cool enough to pull apart and enjoy! Love this!! We camp here on our homestead, (i.e. whatever I forgot is just up the hill in the fridge) but I’m taking our three youngins’ on our first away from home trip! This will be a real treat! Oh…doesn’t the butter need to be stored in the cooler, too? Or did you just mean other than “normal” ingredients that would already be packed? Hey Billie! This will definitely be a great treat!! I don’t count the butter as needing to be cold because you melt it anyway. 😛 When I don’t have room in the cooler, I just put a stick of butter in a sealed jar and let it melt. Doesn’t change the recipe at all! We made this on that trip (I know….late report!) It was so wonderful! The kids loved coating the biscuit pieces shake n’ bake style in a bag, and the unexpected surprise and my favorite part was the caramelized “sauce” that drizzled over everything (I plipped it over on a plate)! Anyway, it’s late but thank you…we had a blast! I’m just learning to cook with a Dutch oven over a gas stove. The recipe is simple enough but don’t have an idea of how long the Dutch oven takes to heat. In short I burned the butter and brown sugar and bottom of the bread. I think I’ll stick to boiling water and soup. Thank you for sharing, this is so GREAT! I am just not seeing what size of dutch oven you used? 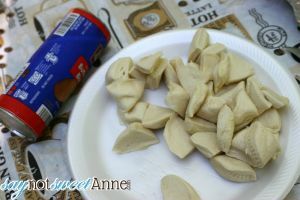 I have a family of 4 (with 2 HUNGRY boys) so I am thinking I need to double this recipe for sure! Thanks Amber! Goodness, I’m not even sure the size, its been hanging around our house for years. I think maybe 9 inch? You could definitely double to batch but just adding more biscuit pieces on top – but make sure to cook it a bit lower in heat for longer, so the bottom pieces don’t burn! Hi! We’re camping this Labor Day weekend and my guys love cinnamon rolls. I’m going to try this and am hoping I don’t burn these. 😉 Do you think a cast iron skillet would work since I’m already taking that along? 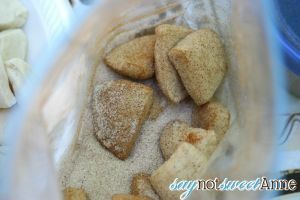 And this sounds like something that could be made ahead of time and have the cut-up coated pieces ready and then have the butter and brown sugar separate to do later. Any thoughts? On a side note, I’m notorious for burning things because I like to cook on the highest heat possible to get things done quicker… obviously it doesn’t always work for me, yet I continue to try although I will painfully follow these directions. 🙂 Thanks! Yes, this could definitely work with a cast iron skillet if you have a good, heavy lid for it to keep the ashed out and create an oven-like environment. The most important part is indirect heat, so make sure you don’t just plop it on some hot coals and forget about it! Can this be prepped ahead of time and then cooked on the campfire? All steps are easy to follow in my opinion. I also love having monkey bread for meal. Would recommend this to any of my friends who want to be a part of nature. This recipe looks great. 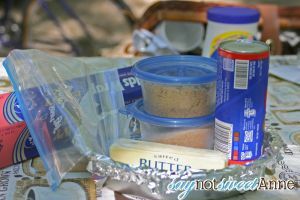 My wife and I are always looking for new recipes for our camping trips. Cooking over the fire is one of my favorite parts of camping. I look forward to trying this on my first trip out this year. Thanks and keep up the good work. 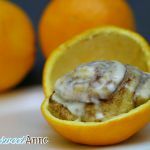 I think that this recipe looks awesome and wanted to try it. I am a little bit confused by the actual cooking directions ‘Bake in dying coals (350°-375°) for 5-10 minutes or until puffed up and center is cooked through. Be careful to avoid direct heat on the bottom, as it might scorch.’ Do you place your pan right in the fire pit on the coals? Or push the coals around it? Or put it over the coals on a grill rack? Hey Kimberly! I’m sorry for the late reply. I usually set it on top the dying coals, but not directly on them. I’ll put a new log or stick down, and then put the pan on that. You could use a grill rack too. Then I put 3-4 coals on top. Hope that helps! Pingback: 32 More Camping Hacks You Definitely Want To Try On Your Next Trip – What The Hack! Thx! Added to the menu for my next camping trip. Can’t wait to try. I learned this from my sister-in-law years ago. It was a great idea. And yummy! This looks like a good food for adventure travels with the family. We like doing camping and adventure road trips. Thanks for the recipe. 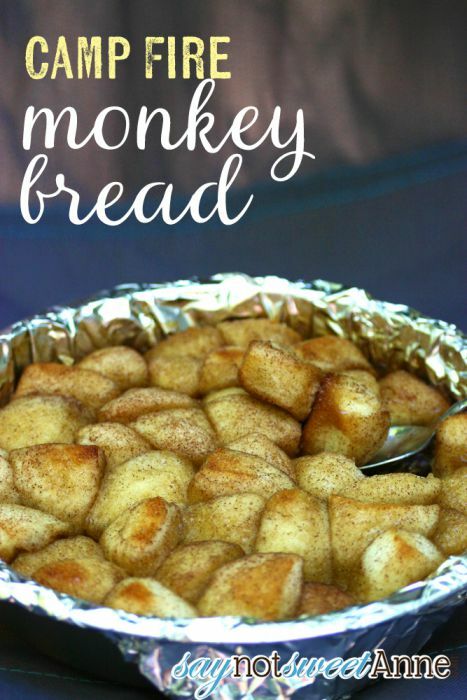 Are they really called monkey bread?